G.W. Anglin has the capacity to generate a wide variety of parts for the heavy vehicle, automotive and general fabrication industries. The combination of our engineers, skilled trade employees and cutting edge technology makes us capable of creating quality custom components. The technology used in the parts manufacturing process include laser, punching, CNC milling, CNC press brake, manual and robotic welding, zinc plating, e-coat, wet paint and powder coat. We currently create parts for a variety of customers which include OEM auto manufacturers and a world leader of construction equipment. 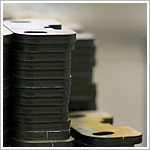 Our unique manufacturing process can competitively meet the demands of large scale projects to short-run productions.